A $6.2 million renovation transformed the former Carnegie Library at 1115 Queen Street West into a 21st century live arts hub and incubator, and the permanent home of The Theatre Centre. The project design is by GBCA Architects, whose transformative work on historic properties includes sites such as Canada’s National Ballet School and over 45 other museum and cultural sites across Canada. This award-winning firm was the natural choice to breathe life back into this neighborhood landmark. The Theatre Centre’s adaptive reuse of the space transforms the interior into a unique live arts facility, and restores the building to its original function as a place of public use and cultural significance. About the Carnegie Library building at Queen St. W & Lisgar St. Listed as one of the city’s heritage properties, the library was designed by city architect Robert McCallum. 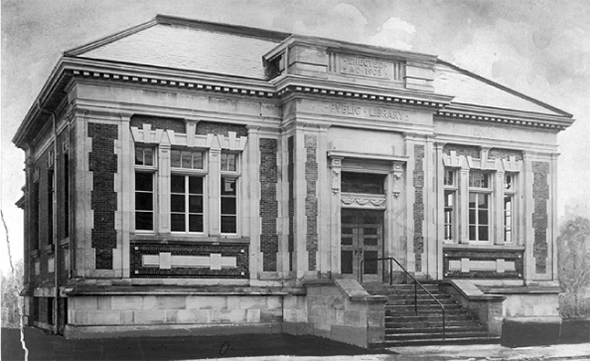 The library was built to serve the residents in the West End and opened its doors in 1909 as the Queen Lisgar Branch Library. It served the community until 1964, when it was replaced by a new Parkdale Library. The building housed the offices of the Parkdale Branch of Toronto Public Health until September of 2012.The former Carnegie Library is a magnificent heritage property built in 1908. This Queen Street landmark was constructed as part of the Andrew Carnegie philanthropy grant program that helped finance 125 free libraries in Canada between 1903 and 1924. It was the second branch in Toronto financed by Carnegie, following Yorkville.